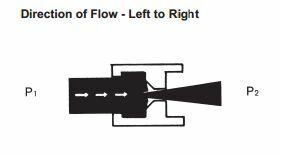 The REG Automatic Flow Regulating Valve automatically regulates the ﬂow within a system. 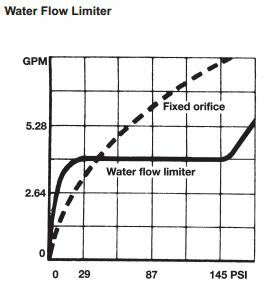 Regardless of pressure ﬂuctuations, the valve keeps the ﬂow permanently constant. Since this state can be maintained within a wide range of pressures, this valve is particularly suitable for networks supplying several users. This is why it is also described as a "balance valve". 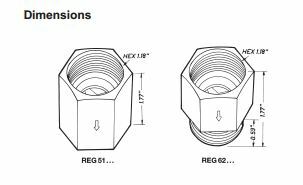 The valve has no manually operated parts and requires no maintenance once it has been installed. There are no electrical or pneumatic control lines. The valve is self-actuating and requires no additional energy source to operate. The REG is an excellent solution for measuring shared well water. Purchasing an REG Flow Regulating Valve for the flow rate that provides even distribution of the resource water to each property assures everyone shares it fairly and evenly (For Example: 5 properties share a well rated for 32 gpm - 32 divided by 5 is 6.4 gpm - So each owner would purchase an REG with a Flow Rate close to 6.4 GPM. In addition, each system could add a water meter (WM, WMP, or WMLF) and a 282 Series shut off valve to get the additional benefits of being able to measure water usage and to be able to shut off water if the valves ever need to be serviced. Used inline from a chiller. Great feature - that it cannot be tampered with. Easy to install and performs exactly as described. Side note: Customer service of flows.com is awesome and went above and beyond my expectations, outshining most companies I have dealt with.